Common throughout in hardwood and mixed forests and thickets in forested landscapes. 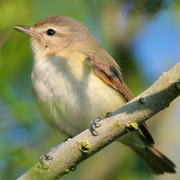 Forestry practices and human settlement have dramatically increased amount of available habitat, as Warbling Vireos thrive in hardwood regrowth following wholesale removal of conifer forests. Scarce or absent only in lowest, most arid rangeland near Columbia River and at highest elevations along Cascade crest. Less common in heavily settled lowlands about Puget Sound.